A few weeks ago my cousin and her husband came out to visit. 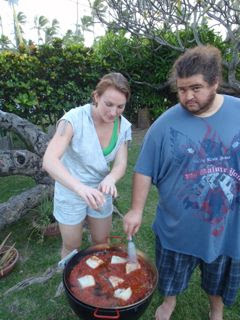 We made a project on Valentines Day to cook a Paella over an open fire. Here we're starting with the shrimp. Kendra adding fish and tomatoes and seasoning. A nice boil with the clams opening up. Finally Beth finished it off with the peas. It was my first paella but I thought it turned out to be a success. This has been a week of Paella, seriously I hve seen it mentioned like 12 times....never heard of it before that, baader meinhof for the win! Hot damn! you two just continue to impress. Always thought one of the larger paella pans would be a killer sled... did I just type that? Must keep craziness inside. Did you put rice in it? Ah! Sounds like a perfect afternoon!!! 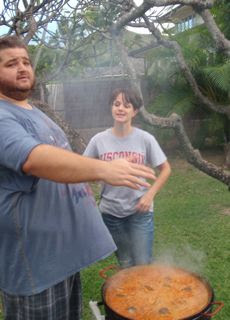 I'm missing my 'ol Miami cookouts (in Atlanta now, its snowed yesteday). Cheers! I love paella so much. I'm totally coming over for the next batch! It's that goofy Miley Cyrus song with Hurley clips to match the lyrics. HYSTERICAL. Uh. That's a wine bottle actually. Kendra put a little white wine in the mix. Uh. Yeah. We put rice in it. you're quite the cook. try making captain crunch chicken fingers w/ a honey yogurt sauce. kinda trashy but tasty none the less. 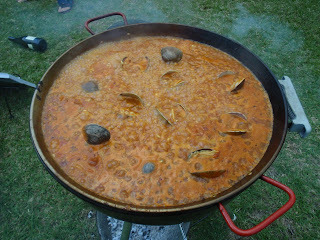 Paella mmmm mmm! Its is great with rabbit or chicken too. 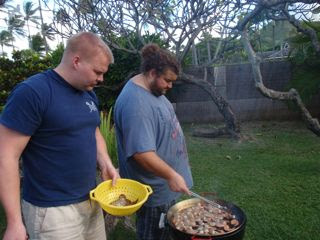 That looks like a nice dish for a cookout, something different. Probably a short cooking time too. Looks great! Strangely enough, the worst paella I ever had was in Seville, Spain. If you're ever in Atlanta, I dig the paella at La Fonda Latina, which has 6 or 7 locations throughout the city. I want to know how the rice cooks without a lid. Hi man! i'm a huge fan... is it true that you are half Chilean? if that so.. you should try "completos" its like a hot dog... take care man keep up with the good job!! Mmmm....that looks good. I'm hungry right now and wish I could grab that through the screen. Good job! Hi Jorge! Here, where I live we never not heard about 'Paella"! I think it's something delicious. Looks fab (even though i'm vegan- with a fish twist) and co-incidentally i was at a twilight market last week where the fOOd was fabulous and i even took photo's of... yes you guessed it, the Paella (Funny that!... oooh a bit like a Lost plot!) X:-o! I don't know the kind of paella yo made guys, but the usual Spanish one has not tomato sauce. Yes, this is not "Paella". Looks awesome Jorge! Is there a recipe around? YUM! That looks amazing...and fun. I've never heard of a paella, but it certainly is artistic-looking! How was the shrimp? If it was rubbery and overcooked you should try adding it as the last ingredient. Shrimp has a relatively short cooking time and can get overcooked very quickly. How has your bread starter been? Bread baking much? That looks really good man, congrats!. Now I really want paella. That looks really yummy. I LOVE me some paella! I've seen some paella pans around but where did you score yours? Just curious...trying to get a good deal, as they can be a little pricey. Loving this 6th and final season of Lost! So bittersweet, but you already knew that. Keep up the great work. Yeah I knew Spanish people would say it's not paella. But that's fine. The Spaniards on the show said the same thing about ANY paella not made in Valencia. Your right it's pureed tomatoes not sauce. We used canned. We also used different seafood. Oh and the shrimp were not rubbery. We cooked them and removed them and then added them again later as the recipe said. My recipe came from the book, "Spain: A Culinary Road Trip." It came out of a television show that Mario Batali made with Gwyneth Paltrow. Cook some rice mixed with saffron and set aside. In a big pot throw little smokies cut up, peppers, onions, garlic, chopped up chicken breast with a little olive oil. Once that is cooked through - add a bag of cleaned shrimp and some butter. Then mix in with the rice. next time make it vegan! So sorry for the double comment on another entry--I guess I didn't read the instructions on posting comments very well! oh my goodness that looks delectable!!!! I think I'm hungry after see this. Looks so delicious!!! There was a lot of smoke? Smoke Monster attack!!!!! March 27 National is Spanish Paella Day! Esa paella seguro que tuvo que estar riquísima, aqui en España la hacemos muy bien pero tu vas mal en caminado. Un saludo. hey hugo everybody love you cuz you are cute. look at this. it is Iranian version of Lost. OMG, it looks amazing, I can smell the stinky-sweet-nose krinkling-pungent spices from here. 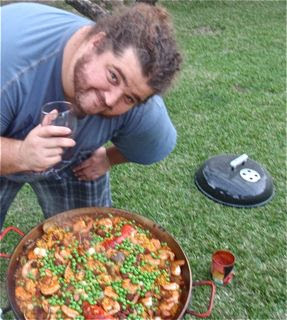 Hi colega, listen, whenever you wanna make una buena paella por favor dame un toque y te enseño, no es que tenga mal aspeto, es que seems to be a different thing than paella, and it´s not because it had´nt been made in Valencia, ´cause I´m from south Spain,, Málaga, and paella doesn´t have to be from Valencia para que sea buena. Ademas me ofrezco para enseñarte a hacer Porra Antequerana, which is a cold soup made with vegetables, jamon serrano, eggs and tuna. I´m sure you´ll love it. Woo-hoo! I adore when I see someone praising Spain´s national dish :) I could not live without it when I was living away from my country so I often cooked it for my international friends who had not even heard of it. Yours looks delicious!! and believe me, it is seriously tricky to get it the first times so well done, congrats. P.S: I just stumbled upon your blog, did not know you had one. I admire your down-to-earth attitude, never lose it Jorge! jorge... sorry but this isn't a paella, I'm living in Valencia (Spain) originally from papella, and this isn't it... this is other thing... otherwise like tasted good ^^. I love peas and i'm from Wisconsin! Yeah Beth! Wow , your life looks pretty normal.........I had imagined lights, glamor , and fences made out of bars of solid gold. this looks magical! i just make my first arroz con pollo! hooray first time cooks! 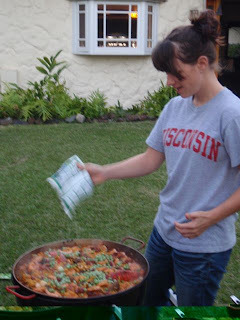 Paella a la americana! love it! Aunque veo más gambas que arroz, but it´s ok! Hugo, soy de Valencia, españa, de donde es original la paella. La tuya no se parece demasiado jeje, pero seguro que estaba buenisima. Si algun dia vienes por mi tierra te invito a una auténtica, vas a flipar.